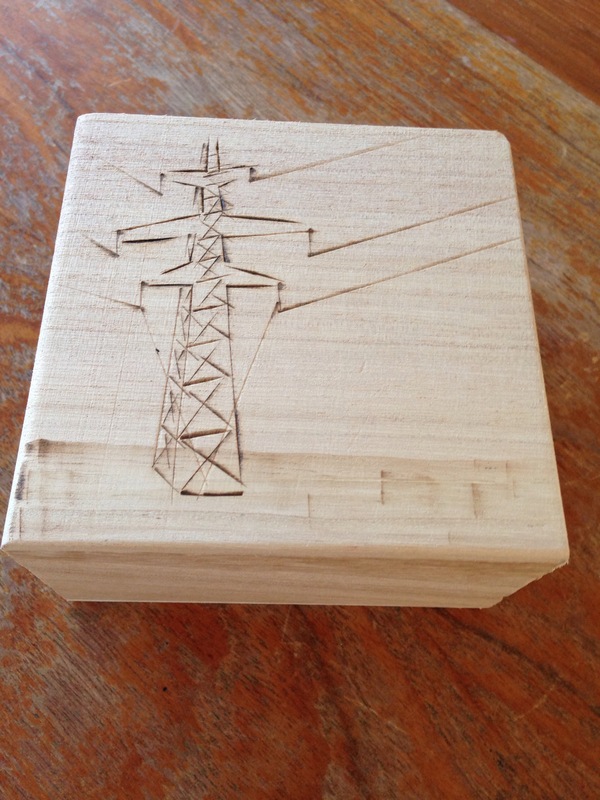 The small wooden box has the image of a pylon burnt by hand into the top. Inside the lid a photograph of birds roosting on a telegraph pole which rises from a meadow’s unmown grass. 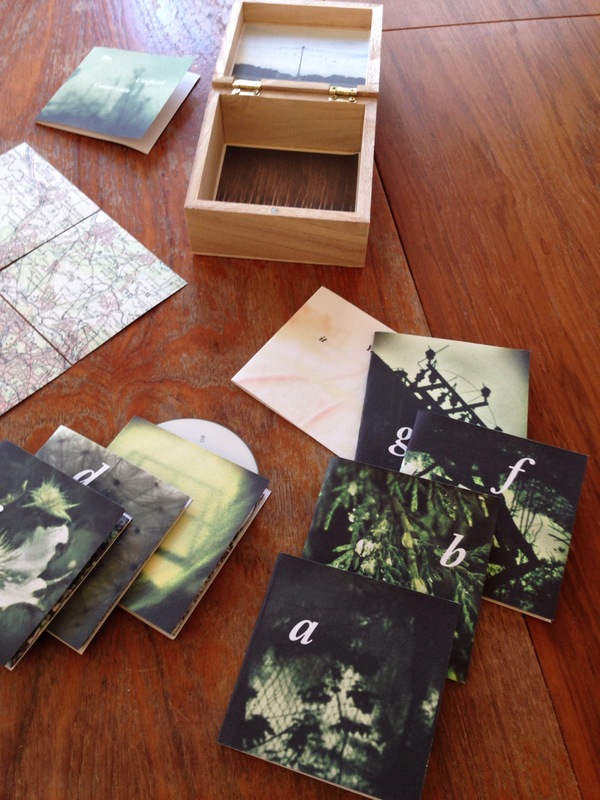 The seven 3 inch CDs are housed inside paper sleeves featuring images so close up that it is hard to identify them. Some are plants, others man made structures – some could by either. These images immediately bring to mind Epping Forest, and the Lee Valley marshes which I know so well. But at the bottom of the box six map fragments, when pieced together turn out to be the less familiar Western edge of London- Ealing, Wembley, Twickenham, and at the top Hertfordshire – tantalisingly close to, although not quite reaching Essex. The landscape of the maps is familiar though – built up urban areas, reservoirs, and on the fringe of the city those inbetween places, where there is clearly green – but not wild – space. London has already subsumed some of it, and, on the map, is a constant threat to these delicate edge lands. This is ‘The Unofficial Countryside’ – a new release from Wist Rec. In this era of downloading and streaming a physical music release can become a sought after artefact – most obvious in the resurgence of vinyl, but releases like this go way beyond the LP. Packaging, artwork, and concept go hand in hand with the music – and when it works are inseparable from one another. This release, each 20 minute disc the work of a different artist, has much of interest musically. Electronic and acoustic sounds crossing the same inbetween space as the rural/ urban artwork. It is often impossible to tell where the boundaries lie between a found sound or field recording and a synth or acoustic line, or between composed or improvised, natural or processed sound. It is the sort of release that is best to immerse yourself in, without trying to unpick the artist’s processes – and it certainly wouldn’t be the same as an iTunes download or on Spotify. The Unofficial Countryside is inspired by Richard Mabey’s book of the same name – and the routes marked on the enclosed maps illustrate the walks he took when writing this study of the space between city and countryside as long ago as 1973. The book was pioneering in this field – an area which continues to be explored by writers, musicians and artists today, and this small box and its contents both continue that journey, encourage a reading of the text which inspired it , and bring a new perspective to past and future Urban Wandering in the edgelands of London. This entry was posted in Music, Uncategorized and tagged richard mabey, unofficial countryside, wistrec.